Have you tried our freshly prepared salads! Tacos - Soft or hard, have them for lunch or dinner! Be sure to try our Taco Rico Fajita next time you visit us. Have you tried our Enchiladas Supreme? and get a free dessert! We can help put together a menu for your special event. 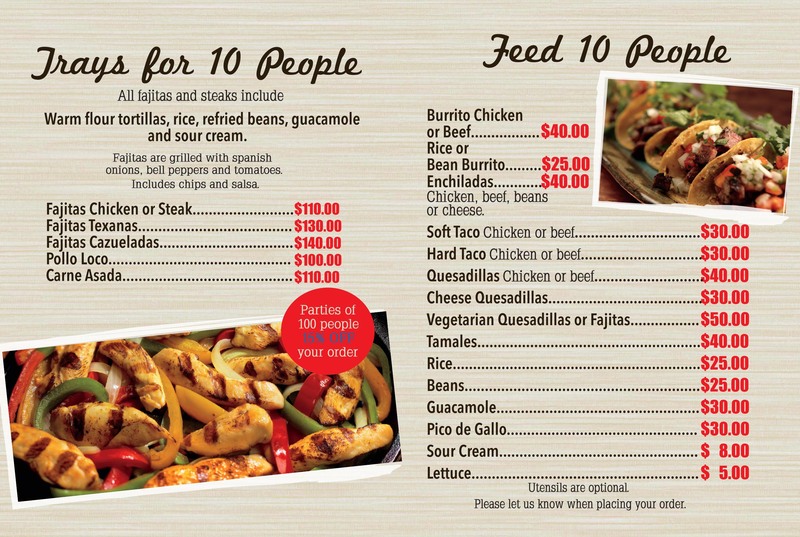 Plan your Holiday party at La Hacienda or let us Cater for you! Call us today and tell us about your special event, gathering or family reunion. We will take care of all the cooking while you entertain your guests and enjoy your reunion without the worry of a big elaborate meal. La Hacienda Mexican Cuisine is at your service and will work with your budget to recommend a menu that best adapts to your party size and likes. Tell us what you celebrate, where and when and we will bring the food, you provide the guests. Assorted meat and choice of salsas. “I love receiveing lunch coupons + they always have the right food options to please my moods... food really tastes like authentic mexican cuisine. Want to know more about the latest promotions and savings? Sign up for our VIP Club and stay updated.